The BC History of Nursing Society publishes the History of Nursing News three times a year, with local, provincial and national history of nursing news, book reviews, articles, photographs and commentary. The first issue of the newsletter came out in 1989 and has continued since then without interruption. 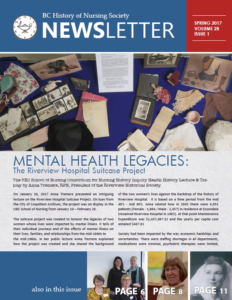 Earlier newsletters, all in digital form, are available from the BCHNS Archives located at UBC. The issues below (2010-2017) can be viewed online by clicking below onto the desired issue. Members only receive the current newsletters. News items, historical research in progress, articles and book reviews are welcomed and appreciated. A committee oversees the content and production of the newsletters with rotating editors.